Lately, Sundays have been my favorite day of the week. All I do is cook, hangout with my family…and watch football (while checking my fantasy football stats). I woke up early and went to Safeway to buy ingredients I needed to make waffles and decided to look for something else to cook to go with the waffles. I walked down every aisle in Safeway a couple times and finally the aisle with the Mexican cheeses and chorizos caught my attention. I’ve never cooked with chorizo, but love the smell and taste. I read the cooking instructions and it seemed easy to cook, but I had a hard time deciding between pork chorizo and beef chorizo. I didn’t know the difference, so I just picked the pork chorizo because I usually eat pork sausages for breakfast. 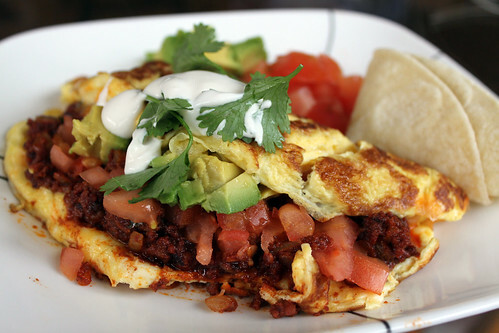 Since I had bunch of vegetables in my fridge that would go well with chorizo, I made chorizo omlette. Unfortunately, I focused on making the perfect omelette and didn’t pay attention to the waffles. Omlettes are easy to make and you can basically use any ingredients you like to create a restaurant quality omelette. You can also use any ingredients or left over meats you have in your fridge and not have to spend $10+. The only thing I had to buy to make the omelette was the chorizo and it was $1.99 at Safeway and it was enough to make 4 3-egg omelettes. For the omelette recipe, I added a little bit of milk to make the omelette fluffy! 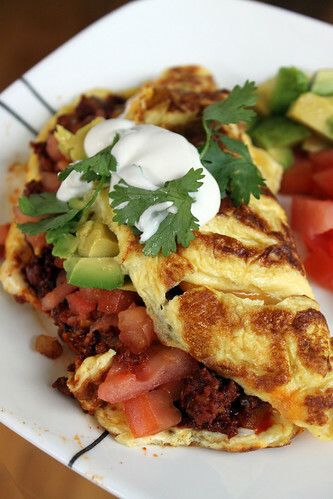 Make sure you have all your ingredients cooked and diced prior to making the omelette as the eggs cook very quickly! Dice onion, jalapeno, garlic cloves, tomato, and set aside. Heat skillet on Medium High until hot and add chorizo to the pan. (Note: Make sure you remove chorizo from the plastic casing) Use a wooden spatula to break up the pieces of sausage and cook until chorizo is thoroughly cook. 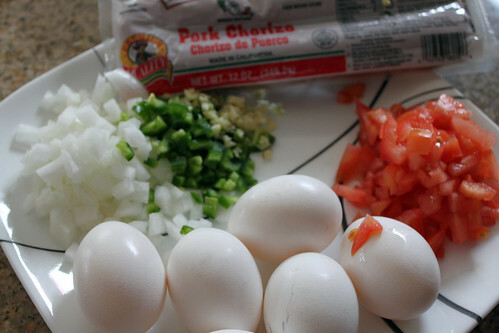 Add onions, jalapenos, and garlic to the chorizo and continue cooking until onions become translucent. After chorizo is done cooking, set aside. In a small bowl, add 3 eggs, a lil salt and pepper, a little milk and beat the eggs with a fork (count to 80). Heat frying pan on Medium and add a little oil. When pan is hot, add eggs to center of the pan and tilt the pan so the eggs spread evenly. As the eggs begin to set, lift the edges of the omelette upwards with a silicone spatula, allowing the uncooked eggs to run underneath. Cook until the eggs have set on the bottom but the top is still a little moist. 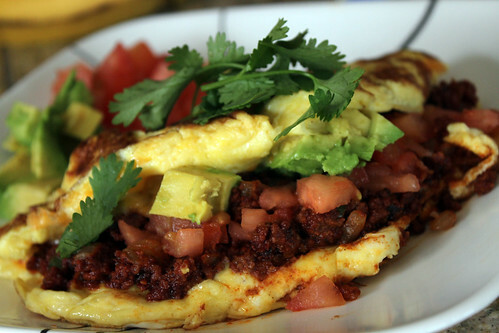 Add Chorizo, tomatoes, and avocado to one side of the omelette. Add Monterey Jack/Cheddar cheese to the other side. Remove from heat and put a cap on the frying pan and allow eggs to cook for another 1 minute. Loosen the omelette away from the pan and tip out onto a warmed plate and gently fold the the omelette in half without breaking. Top with any other ingredients you like and serve immediately with some corn tortillas.